Peñasquito is a surface mine hosting one of the world’s largest silver, gold, zinc and lead reserves. 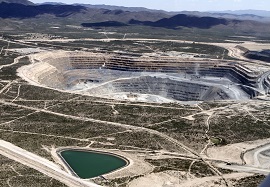 It is located in the state of Zacatecas, Mexico, 17 miles west of the town of Concepción del Oro. At a gold price of $1,200 per ounce, a silver price of $18.00 per ounce (sulfide), a lead price of $0.90 per pound, and a zinc price of $1.05 per pound. Operator reports metal by material type. The sulfide material will be processed by milling. The oxide material will be processed by heap leaching. Gold production guidance figure reflects payable gold in concentrate and dore. Operator did not report production guidance for silver, lead or zinc.